Distributor operation manager works as a supervisor and controller in the company. Their main task is to obtain the goods and then distribute them. They also order and receive goods as well as maintain the record. A resignation letter is submitted by the distributor operation manager when s/he wants to move on. A resignation letter is a formal written document which is written briefly yet comprehensively in order to let the employer know about your departure. Regardless of the issues that you have with your boss, the letter should be friendly because the resignation letter has nothing to do with the issues. It is also advised to proofread your resignation letter so that you can know whether your content is professional. If you are being too emotional in the letter, just discard it. A resignation letter was written by the distributor operation manager usually addresses the supervisor of the company. The exact date on which your resignation letter will be effective should be mentioned in the letter so that there is no confusion in it. 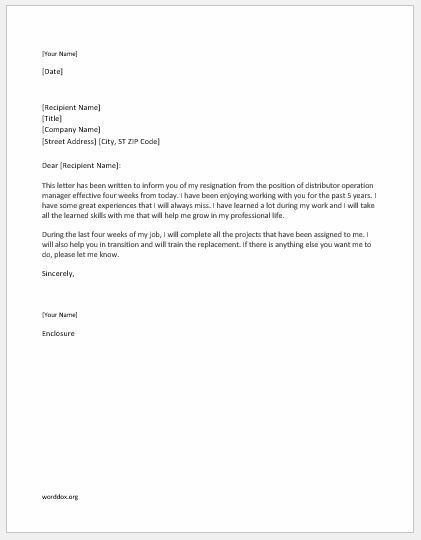 Here is a sample distributor operation manager resignation letter that can also be used as a template if you are not sure about the exact format. This letter has been written to inform you of my resignation from the position of distributor operation manager effective four weeks from today. I have been enjoying working with you for the past 5 years. I have some great experiences that I will always miss. I have learned a lot during my work and I will take all the learned skills with me that will help me grow in my professional life. During the last four weeks of my job, I will complete all the projects that have been assigned to me. I will also help you in transition and will train the replacement. If there is anything else you want me to do, please let me know.